Defined as paintings or drawings of arrangements of object, the still life genre has a code of symbols that is fruitful and a history that is rich. Ancient Egyptians – often cited as the first to explore the genre – painted still life murals on the inside of temples and tombs as offerings to the gods and sustenance for the dead. Providing a two-dimensional feast of figs, grapes, bread, and meats, among other foods that constituted the Ancient Egyptian diet, the society believed that the paintings would convert into real food that could provide in the afterlife. Still life gained popularity in Northern Europe during the 1500’s, a time when art was the visual evangelist of the Christian Faith. Artists such as Jan Van Eyck and Hans Holbein painted arrangements of objects as ciphers for moralistic and religious teachings. Objects became indelibly linked to biblical figures and Christian traditions. Double Portrait of Jean de Dinteville and George de Selve ("The Ambassadors"), (1533). Oil and tempera on oak, National Gallery, London. Simultaneously, a new strain of still life painting rose in popularity: Vanitas. Also entwined with religion, the name “Vanitas” is an allusion to a Bible passage, “vanity of vanities – all is vanity” Ecclesiastes 1.2. This sobering sub-category juxtaposes objects that suggest earthly pleasures such as wine glasses, musical instruments, and jewelry, with objects that suggest the fleetingness of life, such as candles, skulls, and decaying fruit. Throughout history, the genre has used objects for their eloquence. Objects often have hidden meanings that refer to underlying abstract concepts and complex meanings. Using pieces from the Best Of: Still Life collection, we define the symbolism of several commonly-found objects. Lemons – Because the lemon has an inviting yellow color and alluringly translucent flesh and yet are sour, lemons are symbol of the deceptive beauty of nature. Rose - Roses are a symbol of love. Skull – A staple of the Vanitas genre, the skull is a symbol of mortality. Water - Water is a symbol of purity. Clock – A clock is a symbol of the passage of time. Birds – Various birds have different meanings, but in general, birds were originally symbols of resurrection of the soul after death. Dried Flowers - Different flowers stand for meanings, but a dried flower recognizes the passage of time. Peach – the peach is a symbol of truth and salvation. Apples – Apples have a long-standing association with the bible as the “forbidden fruit.” Because of this apples symbolize the fall of man, original sin, temptation, knowledge, and youthfulness. 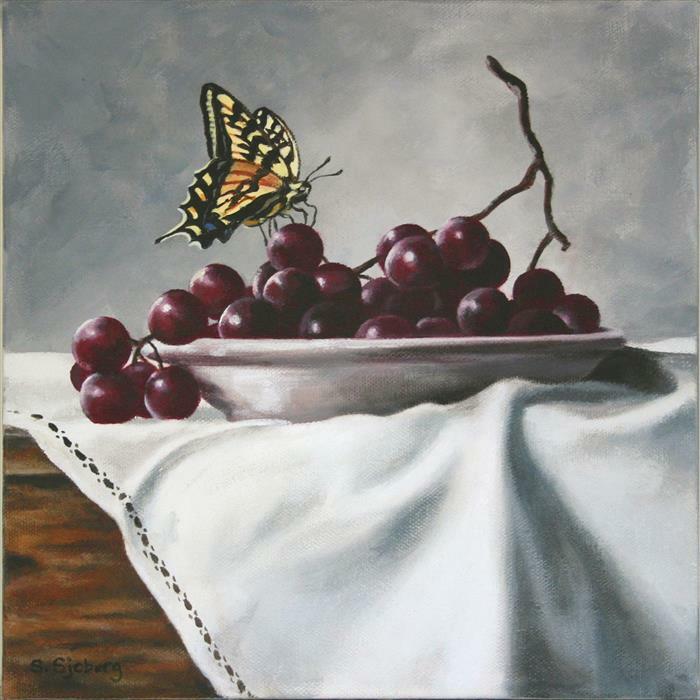 Grapes – Grapes allude to both the blood of Jesus Christ and the Roman god Bacchus. In a Christian tradition, they are a symbol of fertility and salvation. In the Roman tradition, they are a symbol of drunkenness, debauchery and earthly pleasures. Butterfly – Butterflies are a representation of the soul. See the full Best Of: Still Life collection at UGallery.